Hoodedwept AW17 styled among fellow Australian Designers for Schwarzkopf 2017 Hair Gala, Sydney. Featured pieces / Remus Rivet Top, Andromeda Drape Blouse, Atlas Shirt, Nebula Drape Top, Wheeler Hooded Shirt, Lazarus Cargo Pant, Nimbus sheer two piece top. Ragtrader Magazine feature covering Hoodedwept's Paris Fashion Week debut by invitation from the reknowned No10 Showroom/Cube this coming September 2017. The showing has been made possible with the kind assistance of the Department of Culture And The Arts. Feature article on the Hoodedwept AW17 collection "Nexus" by luxury-noir retailer Kultlike.com in the USA, discussing inspiration behind the collection. LUXURY LIVING DECEMBER 2016 - FULL PAGE ARTICLE. Interview with Hoodedwept Designer Neil Sheriff on the trajectory of the brand, the new collection and his personal thoughts on the art and power of fashion. Interview with Writer Scott Patrick Mitchell and Designer Neil Sheriff for Out In Perth Magazine, regarding the new collection SS17 - Kintsukuroi and the journey of Hoodedwept. WORDS: - Scott Patrick Mitchell PHOTOS: - Alan Chau @ Part Blue Photography MODELS - Adrian Fullin @ Chadwick Models - Casey Venning. 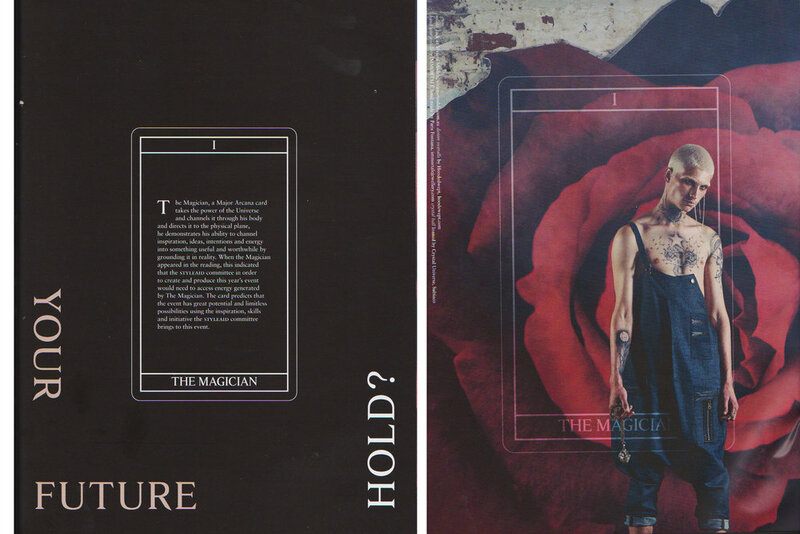 July/August 2016 - After being invited to show 17 looks of our SS17 collection at the salubrious charity fashion event, Hoodedwept were among three designers asked to create a key look for the promotional campaign of Tarot - Styleaid 2016. Hoodedwept were granted "The Magician" to interpret through clothing and the resulting images were created by Fashion Guru Aly May, orchestrated by Mark Ried from WA AIDS COUNCIL, shot by Richard Jefferson for publication and broad use in STM Magazine, The West Australian, Out In Perth Magazine, used in all large-scale advertising at Crown Metropol and on all official social media streams including the WA AIDS COUNCIL website. TAROT PHOTOS: Richard Jefferson HOODEDWEPT PHOTO: Aaron McPolin. Full-page article in The Western Suburbs Magazine, May 2016 regarding AW16 - Faith/Morality.